I get it. Baking from scratch may seem like a lot of work. Not only do you have to make sure you have all the ingredients, but you also need to have the time to mix it together. Oh and bake it yet to boot! Hold on, though… Before we go too far down that self-induced too-little-time pity party, you have to admit that when you bite into a warm, fresh from the oven homemade baked good, you are in heaven. In this case, the pumpkin-spice filled clouds burst open and pumpkin cheesecake muffins floated down! I love that when you bake your own goods at home, you can taste the quality ingredients that make up each bite and you’re cognizant of the time and love that was put into each treat. I know baking doesn’t relax everyone like it does for me, but I also know everyone enjoys something delicious. 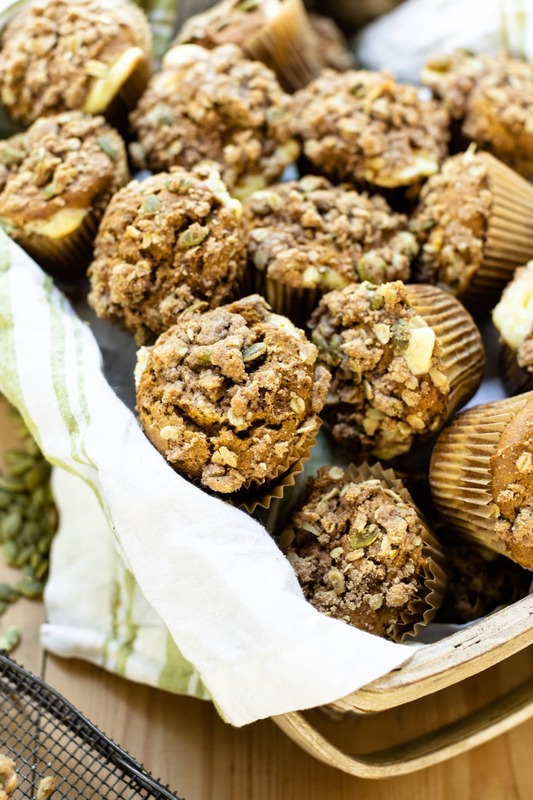 These pumpkin cheesecake muffins are totally worth the effort, which in all honesty, isn’t really too much. And who doesn’t love anything pumpkin?! The pumpkin muffin base is moist and so flavorful. 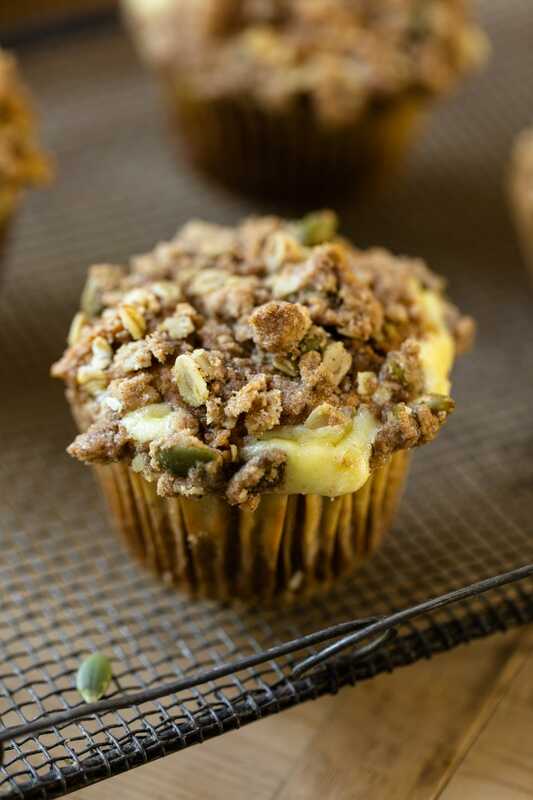 The cheesecake layer has a bit of a soft texture, which is just what you want in this muffin. The streusel topping is that perfect bit of crunch that perfectly caps off the whole experience. If my (probably over the top) description thus far doesn’t convince you, just picture this. Imagine having the perfect treat to enjoy on a chilly fall morning with a steaming cup of coffee. Yes please! Doesn’t that cheesecake filling in the middle just look soooo good?! Trust me, it is! As always, let me know in the comments if you make these muffins! I’d love to know how much you like/love these! 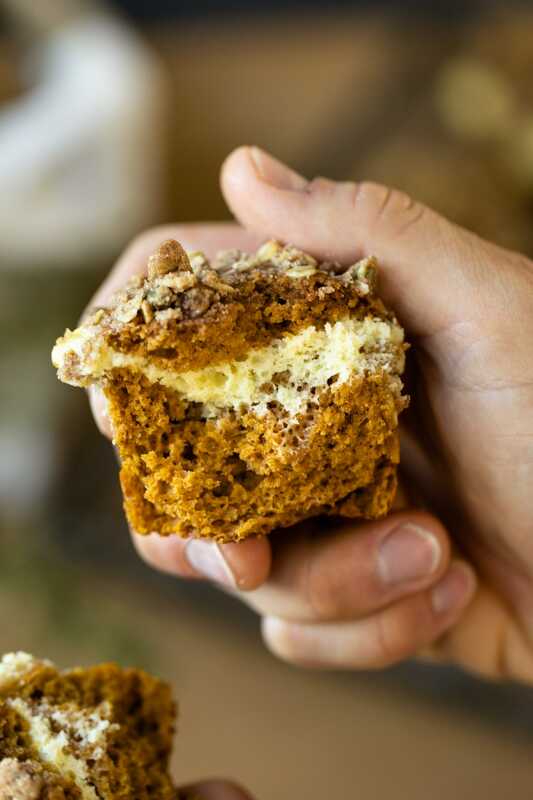 Pumpkin is good on its own, but when it’s combined with a cheesecake filling, could it get any better?! 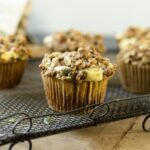 Seriously, these pumpkin cheesecake muffins are the best and since they’re topped with a streusel topping, you just can’t go wrong! In a medium bowl, combine the whole wheat flour, oats, brown sugar, roasted pepitas and cinnamon. Stir to evenly combine. Cut butter into small pieces and work into the mixture until it looks like wet sand, as would be done for pastry dough. Set aside. In a small bowl, whisk the cream cheese, sugar and egg until smooth with no lumps. Prepare the batter in a large bowl. Whisk the pumpkin puree and brown sugar until smooth. Whisk in the eggs, oil, molasses and vanilla until combined. Add the flours, baking powder, baking soda, cinnamon, ginger, nutmeg and salt. Whisk until just combined and no streaks remain. Line a 12-cup muffin tin with baking liners. Fill each liner 1/3 full with prepared batter. Use an offset spatula to create a well in the center of each muffin. Evenly portion cheesecake filling into the wells. Top with the prepared streusel. Bake in a preheated oven until puffed and set, 20-23 minutes. Once baked, remove from oven and cool 15 minutes on a cooling rack.